Significant not only because of what it represents but also by how it was engraved. 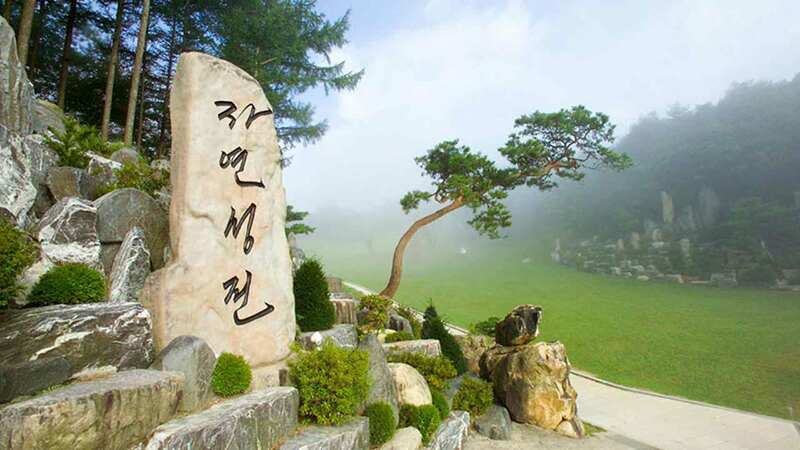 The Natural Temple Signboard Rock acts as a sign for the Wolmyeongdong Natural Temple. It was engraved with Pastor Jung Myung Seok’s hand-written calligraphy. He finished his calligraphy masterpiece after writing the words Natural Temple (자연 성전) more than 500 times. It is an expression of his devoted heart and soul to the Trinity. So, Pastor Jung kept on writing. He wrote it more than 500 times while the Holy Son coached him. On his last attempt, the Holy Son said that He liked it and found it beautiful. The character ‘Ja’ (자) was written very naturally, the character ‘Yeon’ (연) with intensity, ‘Seong’ (성) with timidity, and ‘Jeon’ (전) with authority. As Jung was praying about where to erect this big rock, he felt unsure about where the most ideal and most beautiful spot would be. Although he thought it would be best to place the Natural Temple Signboard Rock facing towards the left of its current position, he couldn’t make up his mind. In the end, according to the Holy Son’s words, Pastor Jung clearly set the direction that the Natural Temple Signboard Rock should face. After that, he went to buy the actual rock he could engrave his calligraphy on. So he called his brother-in-law (Elder Kim Hyun-do) to tell him to go and buy a good rock for around a thousand dollars. His brother-in-law went to buy a rock but came back saying that he could not buy one because they were all so expensive. He could not even bargain with the small amount of money he had. So, Pastor Jung told him to give the owner only 5 thousand dollars. However, the owner of the rock company asked for three times as much. In response, Pastor Jung told his brother-in-law to tell the owner that he had come to buy a rock that was about five thousand dollars because God and the Lord told him that the owner had found a rock that was worth five thousand dollars. However, he and his wife kept insisting that five thousand dollars was not enough, so it was hard to continue the negotiation. But God inspired the owner’s heart strongly through his brother-in-law. After God moved the owner’s heart by saying these things through his brother-in-law’s lips, the owner thought about what to do for a long time and finally said that he would give us the rock. In this way, we were able to thankfully purchase the Signboard Rock at such a low price. When Pastor Jung saw the Natural Temple Signboard Rock, he liked it. The quality was good, and it was a firm rock with a smooth surface. The rock is as smooth as a woman’s skin and as smooth as a rock from a riverbed. It was Jehovah-Jireh. It is good not only because it is a natural rock but because it has the structure of a signboard. The bottom is wide, the top is of a perfect width, and the height is also spot-on at 6 m (18 ft). Pastor Jung erected it safely and set it deeply in the ground. Erecting the Signboard Rock was like erecting the cornerstone of the Natural Temple. The Natural Temple Signboard Rock has a tint of yellow and scarlet, and it is a gemstone rock that shines like pure gold. Even the owner admitted that it was the first rock that they had found that was this big and smooth. Although it was from a mountain, it is smooth and strong like a rock from a river. It is a great rock masterpiece. Even 15 years after we bought this rock, a similar rock has still not been found by that company. Pastor Jung actually wanted to replace the rock if there were a better one. So he requested all the rock companies in Korea to let him know if they ever found one, but he has not heard anything since. It was a miracle. The situation was mysterious. It was Jehovah Jireh. As a signboard rock, it is a grand masterpiece. It is a rock that is like a gemstone. Surely, the Natural Temple and all the stories within it are majestic, mysterious, and beautiful. Everyone should look at it knowing these background stories. Then they will be amazed and thankful, their thoughts will change, and they will be shocked.